Last week I had to move several of the websites I look after to new hosts. It was a task I was dreading, but with some research and a bit of trial and error I managed to slim down the procedure to a set of managable steps. After reading about the different WordPress plugins which would help me achieve a smooth move, I chose to use the Duplicator plugin. It had many good reviews and, importantly for me, it is free. I had cPanel access to both the source and destination hosting accounts, so was able to set things up there without having to ask technical support for help. First an important note: It’s much easier to do the website move if you can change the nameservers to point to the new hosts nameservers. This does mean a small amount of site downtime, but if this is acceptable, then it’s far easier. However, in some cases that’s undesirable. You may need to install your site on your new hosting then swap over the nameservers once you’re confident that the new site is working properly. This should give no user downtime – not even a maintenance message! To do this, we will have to edit the Windows host file to access the site on the new hosting. If you’re on a Mac, you may need to do a Google search as I don’t know how that differs. Here is Duplicator’s tutorial on moving sites. This latest version was made in January 2014 but is still current. However, my way seems (to me at least) to be less complex. 1. 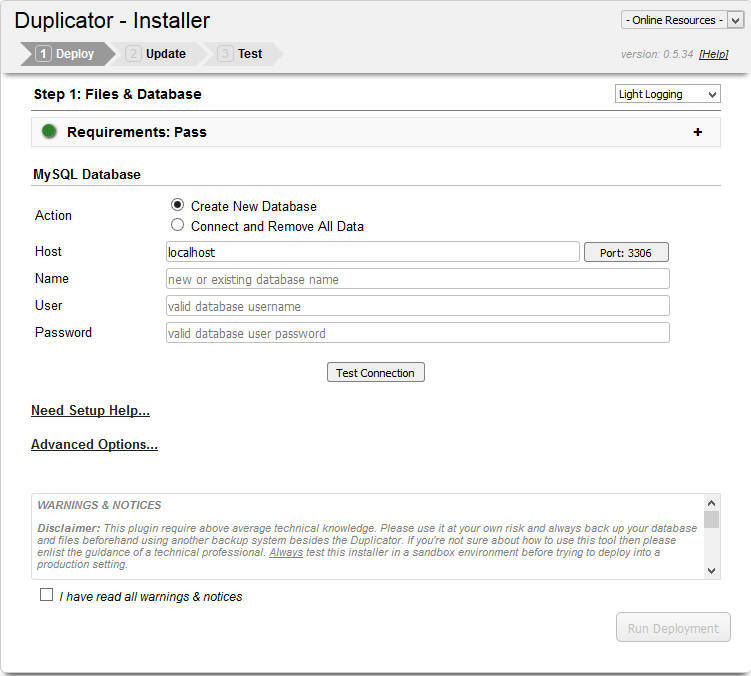 Install the Duplicator plugin on the domain to be moved. 2. Follow the instructions to create the package of installer and archive file and download them to your computer. 3. Optionally, log into the control panel. Make a note of the email addresses which have been set up as these will have to be manually reinstated on the new host. Also, note any email forwarding settings as they will also need recreating. 4. If an Addon domain is required, set that up now. If you don’t know what an Addon domain is, then no worries, you won’t need one. a) The easy way: Install WordPress on your new host. Use whatever auto installer is supplied with your host’s version cPanel. Make sure that you install it into the root of the domain you’re moving to not the wp directory. Once it’s installed, go into the cPanel’s File Manager and download wpconfig.php to your local computer. b) The techie way: In the cPanel of the new host, create a MySQL database by finding the MSQL databases icon in the control panel. Go into that section. Type in a new database name and click createDatabase. Once it pops up the confirmation page, copy the line “Added database <<databasename>>” and paste it into a text file. Go back. Now we need to create a user so find the appropriate section and type in a username. I usually have the same name as the database unless it’s too long in which case anything is fine, Copy and paste the username into a text doc and also type the password in, we’ll need those later when we run the duplicator installer. Now add the user to the database. On the confirmation screen, I check the all privileges box then click “Make Changes”. That’s that section complete so return to the main cPanel page. 6. Use cPanel’s FileManager to Upload the installer.php file and the archive zip file (which you downloaded in step 1) into the root directory for the domain on the new hosting. If you’re not using an Addon domain, then it’ll almost certainly be the public_html directory. The duplicator written instructions say to put the files in their own sub-directory, but that just hasn’t worked for me. If the name servers are already set up to point at the new site, then we can just type the address in the address bar and that should work fine. substituting the IP address of the site – your new host should have sent you this in your welcome email. If it’s an Addon domain then it might be hard to browse to unless the nameservers have already been set. If not set, then we’re going to have to use a path from the parent domain. In this case we might need to put a .htaccess file in the root of the addon domain. Otherwise the .htaccess file from the parent domain will control the read/write permissions and stop us from seeing the installer.php file – let alone executing it. 8. Once you have managed to browse to the installer.php file, then it’ll run on it’s own. Follow the instructions. And the DB_PASSWORD value into the password field. Then test the connection, it should pass. You will also need to use cPanel’s Filemanager to rename the wp-config.php (I change it to wp-config.php-old) before proceeding with the install. If you picked option b) paste in the database name, username and password we saved in the text file earlier. Leave the top radio button “Create New Database” selected. Test the connection then proceed with the installation. 9. I had one instance where I was unable to get into the admin section of the new WordPress site after doing the move, so for that reason now I always choose to create a new admin user with a non-preexisting name just to be on the safe side. 11. Allow the duplicator to do it’s cleanup by clicking the appropriate warning messages. Go into the permalinks and save changes (even if no changes have been made) This will update the .htaccess file correctly. Then visit the site. If everything is fine, proceed. If you want the site to be www.sitename.com you’ll probably need to change that in the general settings. 12 Back in the cPanel, go into the file manager and delete the zip file which you uploaded earlier. For some reason, the duplicator’s cleanup routine doesn’t delete it. 14. Make sure the email addresses and the forwarders are set up. 15. Go into your domain registrar account and change the nameservers over. 16. After a couple of hours (or overnight), check all is well. 17. As a belt and braces precaution, I leave the old site on the original host for a week before I delete the site from the original host. That way if there are any issues I can roll back by changing the nameservers. Problem: When clicking home after going to an internal page the URL in the address bar featured the principle domain as well as the Addon domain. Solution: Go into phpMyAdmin, find the wp_options table in the relevant database and in the ‘option_name’ field find the row with the value ‘home’ editing the option_value field to be the same as the siteURL. This should fix the problem but may then lead to problem B. Problem: On HostGator and HostPapa we had a problem whereby trying to access an internal page gave an Internal Server Error 500.
and that solved the problem! All the links are going where they should now, and I’m not getting the internal server errors anymore. And that worked for me too. If this guide is helpful, please let me know in the comments below.